Traveling is an exciting way to see the world with new eyes: meeting new friends, trying exotic cuisines, and exploring different customs. However, traveling is also a way to visit the past and better understand history and our shared cultural heritage. Last year I spent a couple of weeks in Sri Lanka. As the island nation is small in terms of size (although densely packed with beautiful sites), my husband and I decided to spend our honeymoon there so that we could see many of these sites in a short period of time. It was a great choice because we relaxed on picturesque beaches and unwound in luxurious hotels, but also explored local culture and historic locations. We planned an action-packed trip with the help of a close friend from Sri Lanka who happily introduced us to his complex and rich culture. We started our journey in Colombo where we met with our friend’s family. His mother cooked us a delicious home-cooked meal which she made with ingredients, like mangoes, coming from our hosts’ garden. We had only a short time to explore the capital’s frenetic energy of noisy tuk tuks, congested traffic, tiny shops, and friendly locals. We welcomed the opportunity to rest and contemplate at a lovely Buddhist temple complex, Gangaramaya. We also visited a temple on the lake, Seema Malaka, a tranquil place in an energetic city. After leaving Colombo, we volunteered at the Elephant Freedom Project, a sanctuary for elephants. It was incredible: we fed bananas to the elephants, walked them through verdant rice fields, and learned more about their behavior. It was amazing to interact with the animals in a way that did not harm them or isolate them from one another. There are many elephants exploited for tourism, but the Elephant Freedom Project works to provide the animals with happy lives through responsible tourism. (I would advise against visiting any company that offers elephant rides, as working elephants are abused and beaten when disobedient; elephants are intelligent and family-centric animals and it is unnatural for them to be ridden.) Through the rest of our journey, I’d often spot elephants in temples, in the distant landscapes, and the most unexpected places. It was thrilling every time, particularly when a local invited me to jump in a stream with a resting elephant. I accepted the invitation! To delve into the history of Sri Lanka, we explored three of the country’s most famous archaeological sites: Sigiriya, Polonnaruwa, and Dambulla. Sigiriya (“Lion Rock”) is the country’s most visited site. The ancient rock fortress stands 660 feet high and is a UNESCO World Heritage Site. According to Sri Lankan historical records, the fortress was built by King Kasyapa during the fifth century. He built his palace on the top of the enormous rock. During its existence, Sigiriya was a Buddhist settlement, a fortress for a king, a Buddhist monastery, and eventually an outpost of the Kingdom of Kandy. It eventually was lost in the jungle before being rediscovered in 1831. Sigiriya gives visitors a bang for their buck because they can visit the fortress, the palace remains, impressive architecture and natural inlets, and beautiful gardens. In addition, the site includes a “picture gallery” of still vibrant and detailed frescoes of bare-chested women. Another impressive site is Dambulla, a World Heritage Site. It is the largest and best-preserved cave temple complex in Sri Lanka with more than 80 documented caves in the area, however most tourists visit the five caves that are accessible. Prehistoric Sri Lankans most likely inhabited these caves prior to the arrival of Buddhism. The caves contain statues of the Buddha, gods and goddesses, and Sri Lankan kings, and intricate cave paintings. As both tourists and locals leave offerings of fruits and flowers in the caves, mischievous monkeys wait for visitors to leave so that they could steal these treats from the altars. Rounding out our favorite archaeological sites is the impressive Polonnaruwa, the second capital of Sri Lanka. It comprises Brahmanic monuments, massive ruins of a12th century garden-city, rambling greenery and impressive Banyan trees, as well as statues and impressive buildings and devotional sites. The city is protected as a UNESCO World Heritage Site, although much of the area is still unexcavated. While wandering across the massive archaeological site with an art historian tour guide, we felt like Indiana Jones (we also felt like rock stars—Duran Duran filmed a music video there in the 1980s). Some of the temples are covered in forest growth, and the structures still in varying levels of decay. Also roaming freely are monkeys and cows. Although Sri Lankans are very proud of their ancient history, they are also fiercely proud of their tea, an important part of their more modern cultural identity. Ceylon tea, claimed by some to be the best in the world, is the name for tea grown in Sri Lanka (the country was known as Ceylon from 1802 to 1948). The tea plant was first introduced to Sri Lanka in 1824, and now tea production is now one of the main sources of foreign exchange for the nation and accounts for 2% of its GDP. As people drive (most tourists hire a driver as Sri Lanka does not have convenient public transit) through “tea country” they are surrounded by lush fields. It is no wonder that the British felt so comfortable there, as the air in tea country is cool and damp. Not only is the air a nice change of climate, but the rolling hills are stunning. Dotting the steep lush hills are local workers picking tea, dressed in brightly colored saris. It is back-breaking work as I was to discover during my stay at Heritance Tea Factory. My husband and I stayed at the Heritance Tea Factory, a former factory converted into a majestic hotel emerging from the clouds. Upon arrival, guests are invited into an airy lounge to sip tea seasoned with Sri Lankan spices (the country is also famous for its high quality spices). Guests may elect to tour the factory and pick leaves. 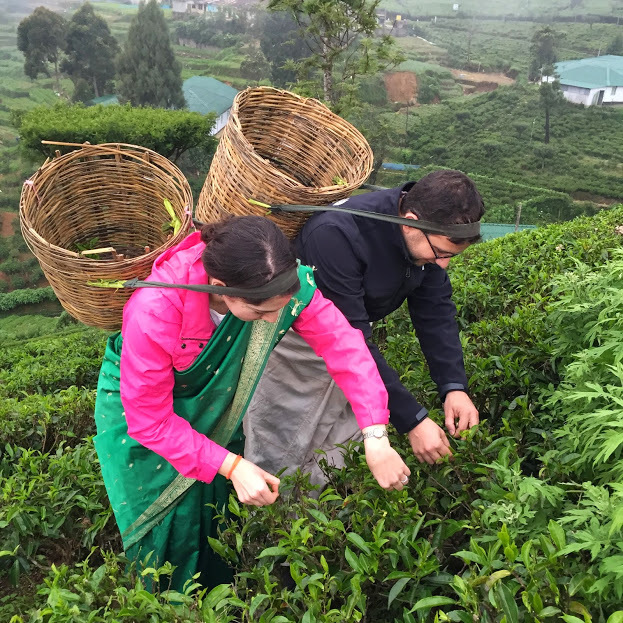 The views in the tea field are breath-taking, and although it sounded fun, hunching over plants while throwing leaves in a basket strapped around your head (all while standing on an incline) is exhausting. During my 20 minutes of picking, I probably only gathered enough leaves for a single cup of tea. However the workers at the factory were nimbly picking leaves and kept zipping by with baskets full of leaves. The experience was a way to understand the difficulties of manual laborers. (The tea pickers at the hotel live in a little village on the outskirts of the plantation run by the hotel). I loved the tea factory, but I had my favorite experience the next day. Our driver brought us to the train departing from Hatton to Elle, as he said we couldn’t miss it—and he was right! We traveled through beautiful vistas overlooking the lush tea country. Other tourists were on the train, but many locals were traveling in our car, eating food, spending time with family, enjoying the sunny afternoon, and watching my expression as I snapped picture after picture of the amazing landscape. The train ride was nothing short of amazing, we hung out the side of the train as we went over steep ravines, we speed past train stations that seemed permanently stuck in the colonial area as we traveled through the gorgeous countryside. However, that wasn’t the end to my favorite day of the trip. That night, my husband and I joined locals and travelers to hike up Sri Lanka’s highest point, Adam’s Peak. Like much of Sri Lanka’s historic sites, the story of Adam’s Peak is complex. At the summit lies Sri Prada, “sacred footprint,” a rock formation in the shape of a footprint. Buddhists claim that it is was made by the Buddha, Hindus claim it belongs to Shiva, while Muslims and Christians believe that it was by Adam or St. Thomas. Pilgrims make the trek up Adam’s Peak; one of the world’s first “travel writers,” Marco Polo, made the climb in the 13th century.) We began the ascent shortly before 2 am so that we could arrive at the summit before sunrise. The trail is remarkable, with shrines lighted up along the trek, and outposts to drink tea and rest weary legs. After nearly four hours of a steady incline, and excruciatingly large steps toward the top, we made it. As people waited and rested, Buddhist chants were played over the loudspeakers. The stars were fading and the first glimmers of light started to appear, casting shadows on the clouds below us. Mere moments before the sun rose and cast its rays, the chanting stopped. There were pure silence. A group of at least about 300 people sat in silence watching the majestic site. For me, it was the best moment of the trip. I experienced a sublime sunrise with pilgrims and tourists—it was a perfect moment. We enjoyed the time at the top as we saw beautiful landscapes below us, but the descent was painful. We took the following day to rest at 98 Acres (one of my all-time favorite hotels) in Elle. 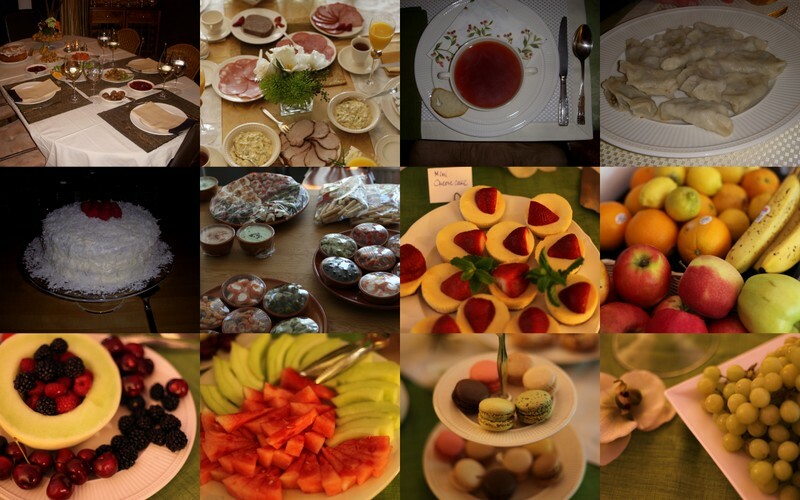 We ate delicious food, enjoyed a refreshing pool with gorgeous views, and heard chanting from a neighboring monastery. The locals are proud of their Buddhist heritage, along with the nation’s religious tolerance. The country has a plethora of intricate Hindu temples, Catholic churches, Islamic buildings, and Buddhist shrines. All of these religious sites were open and welcoming (as long as visitors were properly attired). On New Year Eve, we were blessed by a Buddhist monk—it was a great start to the year. The end of our trip followed a more traditional honeymoon route as we stayed in a jungle chalet during a safari stay. After that, we spent a few lovely days on the gorgeous south coast beaches (I would highly recommend Turtle Bay Hotel for the spacious rooms, beach location, plentiful food and drink, picture-perfect pool, and welcoming staff). One evening, we took a tuk tuk ride with a chatty local to witness sea turtles nesting eggs under the full moon. Another day we relaxed on the beach and shopped at local outposts. And in one of the most spectacular nature sights I’ve ever seen, we watched a massive bird migration along the beach. Tens of thousands of birds perched in the palm trees on the grounds of our hotel—it was an awesome sight. Our last night was in Galle, a walled city founded by Dutch spice traders. We enjoyed the more “Western” style of the town. The walls around the city provided a perfect spot to watch the sunset and an exciting game of cricket. We enjoyed the tiny street cafes, and we bought fun souvenirs for back home. Sri Lankans are proud of their culture, whether it is for their flavorful tea and spicy cuisine, respectful cohabitation with nature, or impressive jungle temples. The people are friendly and welcoming. Like modern-day Greeks who identify with the ancient Athenians who built the Acropolis, Sri Lankans feel connected to their past. On our departure from Sri Lanka, I was pleased to see a sign warning tourists about illegal exports of heritage items. (As an art and cultural heritage attorney, I recognize the importance of educating the public about the value of these objects and the prohibition against their unregulated trade.) It was a beautiful reminder: like most people around the globe, Sri Lankans are happy to share their culture with visitors, but they work to protect the objects that fill them with pride and symbolize their rich history. Leila is art and cultural heritage lawyer and professor. Follow her on Twitter, too!